500 words from is an occasional series in which authors talk about their newly-published books. The Strike. Harvey is best known as a translator of novels by rebellious Chinese writers like Murong Xuecun and Chen Xiwo. His own innovative writing has attracted attention for its adventurous writing style, particularly sentence structures. Harvey also runs Make-Do Publishing, a press which specializes in fiction from Asia. The Strike vividly explores a crisis in the lives of Old Yu and Little Xu, two outsiders in a frozen Chinese border town hit by a traumatic strike. Caught up in the upheaval, guilt-ridden Old Yu embarks on a reckless journey to find the rebellious woman he betrayed. Meanwhile, young drifter Little Xu enters into a dangerous relationship with a stranger on the run. For many writers, I suppose, there is an irresistible mystery about the dependency of form and content. When I started to write this story of a strike in a left-behind border town I wanted to invent a new language that would convey to readers this ice-bound world and all the meanings it contained. This story started when I flew northeast from studies in Beijing after a friend's tip-off that something was going on. This was the middle of the last decade and the talk was of the birth of a new society being forged in the white heat of Deng's revolution, thrusting China forward into a capitalist future. But the tale less told was about the large areas of the country where the intrusion of modernity was felt as painful. There were rumours of explosive protests and demonstrations shaking the northeast where millions of workers were being laid off from state owned factories, although few journalists made it up there. What in retrospect seemed like the decisive confrontation had already passed when I arrived but night after night I watched lines of workers march through the streets of this remote borderland. In the icicled dark so frigid that hot water leaking from a burst pipe would freeze within seconds they filled the empty expanses of People's Square. Their banners made plaintively rational propositions: Our wives ask for our salary, our children ask for education, our parents ask for medical treatment. The main discontent was wages for laid-off workers which had not been paid for months. The town seemed united in solidarity as taxi drivers gave free rides to the protestors and workers lay down on the railroads so that goods could not come in or out. Mesmerised by this apparent irruption of protest from China's unconscious, I ended up staying on for a couple of months in a guesthouse on a vast housing estate which had belonged to a state-owned railcar factory. The estate had hospitals and schools, and my empty guesthouse had once accommodated visiting Russian experts. Most of the factory's divisions had closed; in theory the laid-off workers would continue in perpetuity to receive wages from the shuttered factories, although these were usually far in arrears. Staying in this place haunted by the equivalents of characters from Gogol's Dead Souls, China seemed like a land riven not only by economic and geographic disparities but by temporal distention; torn between past, present and future. As I thought about how to write The Strike, I realized that I wanted the form of my story to somehow be a mimesis of my characters' subjective temporal distention. Chinese fiction is often constrained by the straitjacket of socialist realism; the imperatives of a positive outlook, healthy characters, and formal simplicity, eschewing formal experimentation. I had no such constraints - in fact, for me the more experimentation the better. I had written a number of short pieces using experimental syntax but had been wondering if it would be possible to write something longer. I got down the first lines and wrote my way into it from there: Mrs Zhang was depressed purple leaves scattered along austere avenue because the wind was strong few of her friends were in the park. She came here every morning although this winter was severe to do her exercises required suffering. Walking with her bag of vegetables east of the crematorium there was always a wilderness. Gradually I drew out two plot threads - involving Old Yu, a haunted old man, and Little Xu, a vulnerable young woman - between which wove secondary figures such as the city's mayor, the chief of police, and deadbeat actors. The dual-thread structure turned out to mirror the syntax of the experimental sentences, which often featured two independent clauses ambiguously linked by connectives which can be scanned in different ways: She was Xu Yue lay on her side to stay asleep the sheets had crawled up her thighs a day yet to penetrate. When her eyes opened she couldn't breathe sometimes they turned up the heating so high she saw chairs with spaces inbetween. Some people are put off when they read about experimental language. But my belief is that all imaginative writing should try to create 'novel' dependencies of form and content. 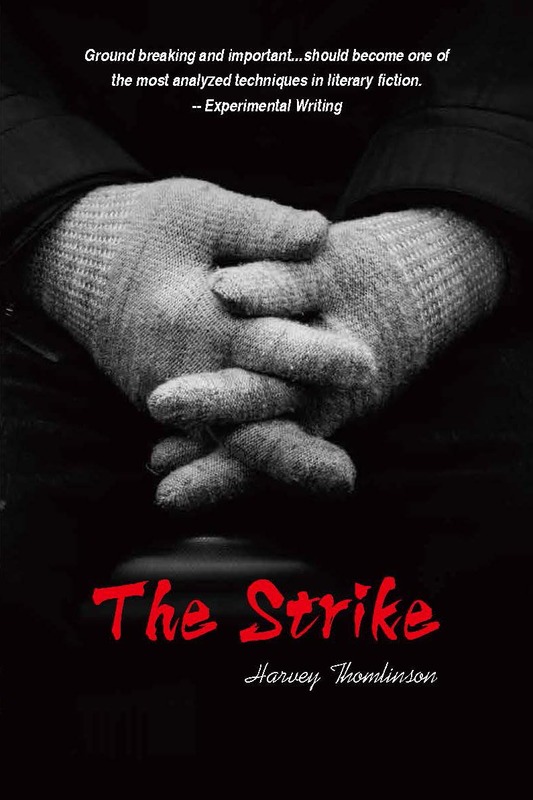 My hope is that the syntax brings the emotional drama of the strike alive in a vivid way, creating a sense of something momentous at stake. The Strike is published by Lucid Play Publishing in paperback and eBook, priced in local currencies.